I was riding my bike, and I was hit by a car. My problem was apparent as soon as the accident happened. I went straight into a coma. I was fortunate enough that a First Aider wasn’t far from me. I was in Emergency for nine days. I’m not sure what they did to me. Sorry. I was at the hospital for about a month and a half. Then I had a form of rehab at home, due to having a home tutor and the fact that I wasn’t able to do anything on my own. It took years for me to be back to normal. My life was worse at first, but now I can finally say that, after accepting the past, I can look into the future with confidence. I miss my teenage childhood as I had to regain a lot of things I had lost. I realise how lucky I have been, and I enjoy that I am now able to give something back to other TBI survivors. My relationships have been affected a bit. It is hard to explain TBI to someone who doesn’t understand it and who thinks it has passed, so I should just get over it. Yes, mainly planning things. I cannot plan many things due to being sleepy a lot. I would say my parents, as they helped me a lot. I hope to be helping other survivors. Yes. Realise that you cannot give up on yourself. TBI is very hard work, but NEVER give up. You never know what is going to happen in the future. It is hard work, but accept the past. You can still look back at it, and then in the future you will realise how far you have come. Be proud of yourself no matter what others say, as you are a survivor who has fought against the odds! Thank you, Stuart, for taking part in this interview. I hope that your experience will offer some hope, comfort, and inspiration to my readers. 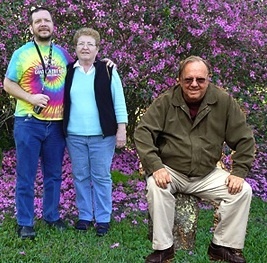 Marleen Salo with her son, Marty Salo (TBI Survivor) and her husband, Al Salo. A car hit my son while he was crossing a street on his bicycle. I was employed as a Registered Nurse. I took several weeks off and then returned to work per advice from professional friends. My husband (Marty’s father) and I were co-caregivers. Physical therapists, school tutors, and friends assisted at intervals. He was in a coma for 7 1/2 weeks. We stayed with him for long hours at the hospital. We went home to sleep, bathe, eat, etc. We brought him home in semi-coma. We fed him, bathed him, and helped him do exercises in bed. He was bedridden for the first few weeks at home. He then used a wheelchair. Eventually he walked with assistance; then he walked unsupported. By fall, he was able to walk into classroom at a private school, with lots of school support. Doctors told us to place him into a nursing home. His pediatrician advised us to set up a “hospital bed” at home and have the physical therapist make home visits. There was no In-patient rehab. It’s hard to answer. I learned that it is possible to come through such trauma stronger and more aware of the precious entity that is life. I learned how many people come around in support at times of crisis. Worse, in that I worried more about every aspect of Marty’s life. Worse, when I saw him struggle in daily activities and when he had to prove himself over and over in every grade level of school. Heartaches, when he could not achieve a goal. I miss the freedom from guilt that I could prevent such pain. I miss Marty’s carefree independence with other kids his age. I like that all of us place more value in day-to-day experiences. We also feel a closeness for having survived as a family. Marty’s physical deficits – driving, etc. We have been a cohesive family. Some marriages dissolve with such stress, but our lives came together. Vacations were put on hold for a few years. Now our social life is good. I hope to spend summers in the mountains and winters in Florida. I want to continue to be in a close relationship with Marty and his wife, Fran. Appreciate the small increments of change. Find external support, such as on the Internet or from other families. Know there is something in you that does not exist until you pass through pain and suffering. It is then you understand. Thank you, Marleen, for taking part in this interview. I hope that your experience will offer some hope, comfort, and inspiration to my readers. If you would like to be a part of the SPEAK OUT! project, please go to TBI Caregiver Interview Questionnaire for a copy of the questions and the release form.